Looking at houses in the $500k and under in Westchester County, I happened upon this 1970s gem in Pound Ridge, beautifully situated on a pond. Magnificently sited overlooking Lake Kitchawan, this Buckminster Fuller geodesic dome house is a very special contemporary retreat. The kitchen…..like a step back in time!!!!!!!!!! Looks perfectly functioning and ready to move in and use! I need help with the description of this photo in the listing….anyone? Sideway stairs? Anyway, I don’t think I’d live there but I do hope someone buys it to keep it. I wonder if the copy that says Buckminster Fuller geodesic dome means all geodesic domes are from the school of Buckminster Fuller or is this house a dome but fashioned like a Fuller dome? I’m not asking the question the right way but you know what I mean, don’t you? It’d be a perfect man cave-getaway weekend house or a perfect retreat for a young city couple. I wish the sellers well. Cool beans. Interesting. I guess Fuller popularized the geodesic dome structure, but, geodesic is a mathematical term. Downsides is that everybody calls you the dome people and you can’t add on – just build another dome. Must look cute in wintertime. There’s a house in Darien that is that shape, more refined, but for sale on and off for years. I’ll see if I can find pic. 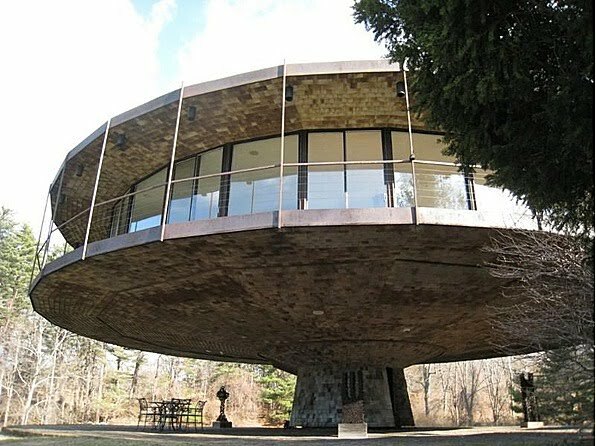 I bet you mean the Richard Foster round house in Wilton. Yes. That’s it. I was wrong on two counts (nothing new). Not Darien. Not oval. Oh well. Thanks. Last photo looks like the skylight is above a balcony. Reminds me of old octagonal houses in New England and maybe elsewhere. Tough to decorate with no right angles. The kitchen is fine for me. Everything is within easy reach. So the “step” like things in the photo are not steps but part of the balcony? No matter what it is, the photo is odd. OT but I have a ‘thing’ for trippy octagonal houses. There used to be one in Banksville and a couple in and around Bedford. I also remember a trippy looking house that was built on stilts off the side of a hill. I think it was on 121 just before the reservoir. I;m thinking back 40 years mindyou. I wouldn’t know if the houses still stand. I think they are cool too and as I said for the geodesic dome home, I hope it isn’t torn down. There are many more contemporary houses in Bedford than one might assume but I don’t know of the octagon ones, not on 121 or in Banksville. Any recollection how far out on 121? It’s a long road.